Canada’s top aboriginal chief and the Truth and Reconciliation Commission have asked to meet Pope Francis during his trip to the United States this week to discuss their call for an apology from the Catholic Church over its role in the residential school system. In the first federal election since the Idle No More movement signalled a renewed political engagement among Canada’s aboriginal population, indigenous leaders are looking for change. National chief Perry Bellegarde told an Assembly of First Nations (AFN) general assembly on July 7 that his group has identified 51 ridings across the country where aboriginal voters can swing the results, including nearly two dozen in the hands of Stephen Harper’s Conservatives. Despite historically low levels of voter turnout among Canada’s indigenous populations, Bellegarde and others say this election is different. “People are starting to realize the power of the First Nations vote if we can get organized,” Bellegarde told Yahoo Canada News. Bellegarde said that, while Canada is ranked in the top 10 in the United Nations' human development index, which includes measures of health, education and employment, the country's aboriginal population ranks in the 60s. The massive Windmill redevelopment on the Ottawa River shoreline, which is land considered sacred to First Nations peoples, is seeking aboriginal construction workers. The 37-acre site, which includes the downtown Gatineau, Que., riverfront, is also expected to include condominium buildings, a boutique hotel, shops, waterfront parks and a network of pedestrian and cycling paths. Course discusses indian residential schools, First Nations and Métis’ distinctive worldview. Starting this fall Camosun College in Victoria will be offering a course for non-aboriginal students to learn what it means to be indigenous in Canada. This course — which will explore First Nations and Métis' unique worldview as well as the trauma of the residential school system and Sixties Scoop — was previously only available for staff and faculty. Corinne Michel, Camosun's indigenization coordinator, has been developing the course over the past few years. Michel, who is of the Secwepemc Nation, told All Points West host Kelly Nakatsuka that the course first began in 2009 as a module in an educator development program. She explained that the course begins by exploring the strengths of First Nations and Métis in Canada. "We talk about indigenous ways of seeing, being, doing and relating to the world, and how those are different from mainstream culture." EDMONTON - Maskwacis Cultural College has two classrooms stuffed full of books. And they’re free for the taking. The summer book giveaway is part of an effort to increase literacy not only in the Maskwacis community, but for indigenous people across the province. “Our goal is to keep children reading ... 60 days of reading, five minutes a day,” Maskwacis Cultural College librarian Manisha Khetarpal said. The program is helping to fill the significant void in access to library services for Alberta’s indigenous communities. Khetarpal said of the 140 First Nation reserves in Alberta, Kanai First Nation southwest of Lethbridge is the only reserve in the province with a public library. She said many of the books are being given away through the “library in a box” program, designed to help families work together on literacy. The program started after a book drive in 2013: people bring a box or a bag and take home a stack of books, as well as stationary, pencils and dictionaries. Alexandra Thomson said the site looked like a parking lot when they started. Lauren Biem remembered it being more like a gravel pit. However, today, the space is alive with all sorts of vegetables — from potatoes to onions to a variety of leafy greens. Thomson and Biem are part of The Askîy Project. "I think for our project, the goal is not necessarily to make money but to promote urban agriculture and promote that it is possible," said Biem, one of six interns who are taking part in the program put on by CHEP Good Food Inc., the Saskatoon Food Council and the University of Saskatchewan College of Agriculture and Bioresources, with funding from The Mosaic Company. The kiscikânis, the Cree word for garden, is located at 301 Avenue K S. The reason the interns gave such stark descriptions of the land when they started was because it's on the former site of a gas station. The garden had to be planted in large plastic barrels placed on wooden pallets because the soil runs the risk of contamination. The Edmonton Arts Council is calling on aboriginal artists to propose public art projects for a revitalized Queen Elizabeth Park that will honour the land’s history. Long before the land south of the North Saskatchewan River and near 105th Street became a park in 1909, it served as a gathering place for the Cree, Blackfoot, and other First Nations. The intention behind a new Aboriginal Art Park, to open in 2017, is to celebrate the region’s largely forgotten history and bring aboriginal artists across the country in conversation with each other and the public. The council will be accepting portfolios and letters of intent from aboriginal artists until Sept. 28. Emerging and established artists are invited to apply. Shortlisted artists (chosen by a committee that includes community members, elders and public art experts) will visit the park this fall and up to six proposals will eventually be selected. The public art project is part of the city’s multi-year effort to revitalize a park that has lost relevance, accessibility and functionality for Edmontonians in recent years. Residential Schools for First Nations children are a chapter of our history we've been hearing a lot about in the past week, since the Truth and Reconciliation Commission - or TRC - released its final report. The stories it contains confirm just how formative the Residential School era was in shaping Canada today. And yet, it's a chapter that's largely absent from the text books and curricula used to teach history in our schools. One recommendation of the Truth and Reconciliation Commission's final report was to change that... and to make lessons about Residential Schools mandatory for all Canadian kids, from kindergarten through Grade 12. For thirty years, Charlene Bearhead has worked as a teacher, principal, education director and superintendent at on- and off-reserve schools in Manitoba and Alberta. She is now an education coordinator for the Truth and Reconciliation Commission. There are already some great resources to relate the gravity of the residential school system in the classroom .... even for very young kids. 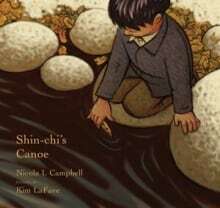 One book is called "Shin-chi's Canoe" written by First Nations author Nicola Campbell. TORONTO – The Host First Nation of the 2015 Pan Am Games has launched a food truck, and it continues its tour Monday at the provincial legislature. The food truck, You Are Welcome, is hosted by the Mississaugas of New Credit First Nation and is the first of its kind in the city. Chef David Wolfman, Culinary Arts Professor at George Brown College and host of Cooking with the Wolfman, has been at the truck, serving up food unlike the typical food truck fare. The menu features items like smoked wild turkey chili, wild blueberry bannock and curried elk and sweet potato in a puff pastry. Showing 161 - 170 of 172 results.